Ceramic tile, one of the most attractive flooring options, is also one of the most effective when it comes to installing a radiant floor heating system. Luxurious warmth combines with stunning looks to provide ideal form and function for your home. Install a heated tile floor and enjoy the subtle comfort of a silent, and very energy-efficient radiant heated floor. Installing an electric heated tile floor is not a difficult task. While it’s important that the electrical work be done by a qualified electrician, any ambitious do-it-yourself homeowner can install the heat cable and tile flooring. Keep in mind that the most important aspect of a heated floor is that it is installed correctly. For general radiant floor heating tips and installation techniques, visit our "Installing Heated Floors" web page. 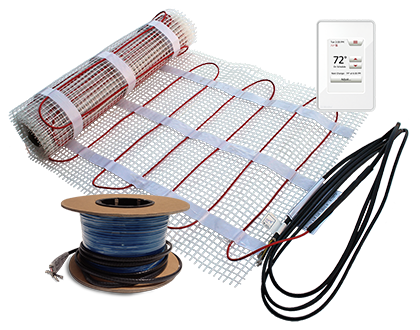 ComfortTile floor heating cable is Warmzone's number one recommended radiant heating solution for warming tile floors. Heat cable can be purchased in spools as well as in mats. 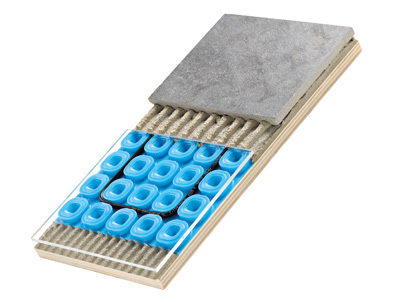 The floor heating mats feature heat cable that is pre-spaced and woven into an adhesive-backed fiberglass mesh that can be rolled out for quick, easy and accurate installation. The 24-inch wide mats are pre-terminated for use with 120 and 240 volts, and are available in a variety of lengths. The conductive properties of ceramic tile makes these floors well suited for radiant floor warming systems. The tile heats quickly, yet retains warmth for long periods, so the system is comfortable and energy efficient. The heating cable or mats can be installed on a variety of subfloors, including: plywood, concrete, pre-stressed concrete panels, crack isolation membrane or any floor surface compatible with the adhesive. The floor should be flat, smooth and free of protruding nails or screw heads that could potentially damage the cable. Depending on your subfloor, thinset or mortar is applied directly over the heat cable, followed by the installation of the tile. 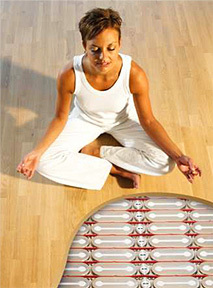 COMFORTTILE is Warmzone's most universally recommended floor heating system. The CT mats include a thin heating cable that is placed on a flexible fiberglass mesh backing with adhesive so it can be rolled out and then secured to the subfloor quickly and easily. This helps to save money by reducing installation time. The floor warming mats are pre-terminated for use with 120 and 240V, and are available in various lengths, heating an area 24-inches wide. ComfortTile floor heating cable is just ⅛-inch in diameter, so very little floor build up is required. ComfortTile systems come complete with a GFCI protected thermostat and strapping to secure and properly space the heating cable. All sizes and adjustments of cable spacing and coverage can be made on-site. The twin conductor heating cable is matched with premium materials, enabling the ComfortTile heat cable to provide superior floor heating performance and fast response times. The PRODESO membrane with ComfortTile heat cable is an outstanding and efficient, cost effective system for heating tile floors. The Prodeso Heat Membrane can be installed over the entire subfloor as an uncoupling, crack isolating and waterproofing membrane. The CT heat cable is easily installed and perfectly spaced in the channels of the patented membrane. The Prodeso membrane is quick to lay out, which helps to reduce installation time and cost. After the membrane is laid out over the subfloor, the cable is installed and the floor surface can be immediately installed over the membrane and cable. The versatile membrane can be used on all types of indoor and outdoor applications. And the Prodeso system is safe under all conditions and weather, and is used to heat a wide variety of floor surfaces. It even waterproofs the substrate in the case of overlaying on cracked or imperfectly cured floors with a risk of vapor stress. HEATSHIELD features lightweight insulated aluminum panels with channels for the heat cable. HeatShield floor heating insulation panels boast a remarkably efficient radiant heat solution that is ideal for heating hardwood floors. The system consists of lightweight, heat-reflecting panels that radiate the heat upwards to the surface of the floor while providing insulation from the ground. There’s no need to embed the heating cables in a mud base with HeatShield Panels. Simply place the insulation panels on the subfloor, press the ComfortTile heating cable into the grooves provided and lay the hardwood or laminate floor directly on top. HeatShield floor insulation panels consist of a ½-inch thick polystyrene insulation covered with a thin, specially profiled aluminum. The panels ensure maximum upward heat distribution that significantly reduces energy consumption as well as downward insulation and optimum upward heat distribution that significantly reduces energy consumption. HeatShield Panels are so efficient that you typically only have to run your floor heating system for a short period of time, which further saves you money. For more information on ComfortTile radiant floor heating systems, call 888.488.9276 and speak to a friendly radiant heat expert.